Hydroponics is very dependent on water as a nutrient fulfillment in plants. Fulfillment of plant nutrients in hydroponics can be given in the form of nutrients containing nutrients needed by plants. The planting media used is usually used plastic bottles or paralon pipes. Of course hydroponics can be placed in any area because it is easy to move and does not require a large area. Aquaponik is a cultivation technique that is combined with aquaculture such as fish. In this technique, the fish feces that are released will be used by plants as fertilizer to meet their nutrients. The place to hold fish becomes clean from dirt. Aquaponics establishes mutualism symbiosis in which plants and fish mutate one another. The planting medium used is soil. 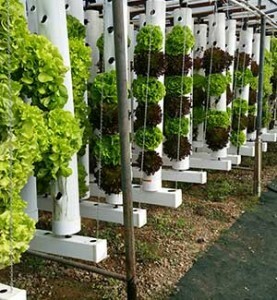 However, aquaponics do not need to be given fertilizer anymore because the sources of nutrients used are from cultivated fish manure.Wall gardening is a vertical cultivation technique that uses the wall as a cropping model. This technique is almost the same as verticulture, the difference is in the technique of wall gardening usually centered on ornamental plants instead of vegetable plants. Many office buildings or shopping centers have used this cultivation technique. The planting media used are soil, so fertilization in the fulfillment of nutrients needs to be considered in this technique so that ornamental plants remain beautiful to look at. Those are some of the techniques in urban farming that can be applied in urban areas. For mothers who like to cook, they can also use urban farming because cooking ingredients in the form of vegetables that have been planted can be picked directly without having to go to the market to buy and of course it is still fresh. Aside from not requiring a large area, urban farming also does not require a quite expensive cost in its application.